Described as motley and diverse, Colombian cuisine reflects the country’s history with indigenous, Spanish, and African influences. Colombia’s variety of rich soils and climates produces a wide range of unique, flavorful products that find their way into the country’s vibrant restaurants and kitchens. From high-class, renowned establishments to tiny local spots serving traditional food, this selection represents ten of the best restaurants Bogotá has to offer. The idea behind Café Rec came to Jorge Moreno when his collection of tape recorders became too cumbersome. He and his wife decided to open a place in which they could exhibit his numerous recording machines. Combining this with a cafe serving freshly ground coffee, the establishment became a sort of cafe-museum, where the walls are lined with tape recorders. As their desire was always to serve top-notch coffees, they offer three different methods of brew preparation – the siphon brewing method, AeroPress for espressos, or coffee that is manually filtered with a dripper. The organizer of frequent live music soirees, Café Rec has become a popular local establishment promoting and sharing musical culture. Considered one of the best fine cuisine restaurants in Bogotá, Matiz features four distinctive settings and offers three different menus to satisfy all palates. With its classical and sober decor, the dining room opens onto an outdoor terrace and a waterfall. On the second floor, the lounge, furnished with cozy sofas to relax and enjoy one of Matiz’s numerous intoxicating concoctions with some contemporary music, creates a congenial atmosphere; while the two reservados convey a quieter mood with dark but warm colors and wooden wine racks embedded in mahogany-paneled walls. A graduate of prestigious culinary schools, Chef Nicolas Quintano embraces cutting-edge techniques to serve dishes with adventurous flavors and stunning presentations. His creativity does not stop at food, as Matiz’s liqueur menu offers 19 special cocktails, taking advantage of the wide range of tropical fruits that blossom in Colombia. Nazca prides itself on offering authentic Peruvian cuisine that would transport any Peruvian back to their childhood. With fresh homemade food, the great attention paid to presentation adds an artistic touch to their dishes. These are served in a modern, shiny red and black interior, with an impressive wooden-step entrance and large glass doors. The VIP room, on the second floor, seems to float above the main dining area. Highly recommended is the restaurant’s panoply of fish, directly brought from the Peruvian coasts. Nazca also offers cookery classes to educate those interested on the secrets behind their dishes, as well as cocktail classes and tasting sessions to pass on the art of cocktail mixing. Fulanitos specializes in typical food from Valle del Cauca, a region located on the western side of Colombia by the Pacific coast. This family-run restaurant is set in a refurbished colonial house exuding a rustic and charming atmosphere. Its most popular dish and drink are the sancocho de gallina (a soup/stew made of chicken, vegetables, such as plantains, and yuca) and the lulada, a beverage made from a typical fruit of the region, the lulo. These local treats can be savored on the patio, which offers superb views over the historical neighborhood of La Candelaria and its colonial baroque architecture. While Il Filleto has built up a solid reputation for its meat, its generous à la carte menu also includes vegetarian dishes, pasta and risotto. The Tuscan villa decor with vines, indoor stone arches and wooden ceiling beams provides the perfect backdrop to complement Il Filetto’s Italian touch. The restaurant also offers cookery courses to master the techniques of Argentine parrilla, as well as the recipes for the best side dishes and salads to serve with meat. The gourmet shop on the ground floor sells exclusive brands and products from all over the world. From meat and truffle oil to chocolate and turrones, Il Filetto Gourmet makes a rule of selecting the best ingredients to take home. Located outside the center of Bogotá, this renowned club-restaurant and its eccentric decor attracts many visitors. Its 19-page à la carte menu includes an eclectic range of dishes, from tapas, salads and soups to meat and fish. 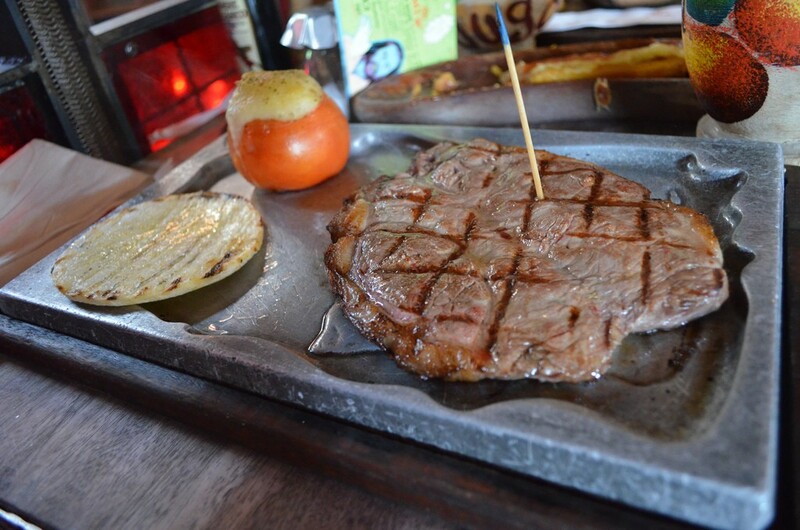 Among these numerous options, Andres Carne de Res’ specialty is its meat cooked a la parrilla, on a typical Argentine grill. The restaurant is strewn with decorations of all kinds. Every wall displays bright and colorful items; the old clocks, metallic receptacles, flags, and a significant collection of red hearts quickly became the establishment’s most important symbols. Located in Usaquén, a commercial area in northern Bogotá, the warehouse-style La Bodega de Abasto is a spin-off of the restaurant Abasto. The chef, Luz Beatriz Vélez, makes a point of working with ‘zero-km’ ingredients – that is, ingredients that have travelled as short a distance as possible from their origin to our plate – to serve healthy food, bursting with flavor. Visitors are surrounded by straw baskets full of the freshest produce, bananas and cloves of garlic hanging above their heads, contrasting with the cold metal-and-brick interior. With the Bodega, Vélez has brilliantly combined the concept of market and restaurant, giving her clients the opportunity to both eat and purchase local and organic produce, such as vegetables, grains, aromatic plants, bread, and freshly roasted coffee. La Galerie defines its style as slow casual food, a practice based on the idea of food sharing – comparable to traditional Spanish tapas, but in larger portions. Employing traditional techniques learned at the Art Institute of New York City, chef Andrés Busquets heads up the kitchen to serve international, expertly executed gourmet dishes. The dining room features a simple black and white decor, with glass mosaic tables providing a touch of color. On the restaurant’s terrace, the music exudes a relaxed and convivial atmosphere ideal in which to savor a fresh cocktail. Wishing to promote young Colombian artists, the restaurant also offers a space for contemporary art exhibitions. Restaurante Casa de Santa Clara, also known as La Mercedes, was built in Usaquén (northern Bogotá) and brought all the way up to the top of the Monserrate Mountain. It boasts spectacular panoramic views over Bogotá by day and night. Colombian coffee can be savored while contemplating historical photographs of Bogotá and its architecture on the walls. The restaurant serves up an eclectic range of dishes from the different regions of Colombia, such as bandeja paisa, ajiaco, and ceviche, but also international food. Two-hour guided eco tours which start from the top of the Monserrate Mountain, then plunge into the Silent Forest, finish with a well-deserved breakfast at the Casa de Santa Clara. Dim lighting, an open fireplace in the middle of the room and live music playing on certain nights, the Merlín Café could have limited itself to being a traditional romantic place for couples to have a quiet dinner in an intimate setting. Yet its owner has opted for playing a more original card – Dragon and goblin figurines as well as paintings adorn the restaurant walls, giving it a touch of fantasy and explaining why it defines itself as a ‘restaurant gallery’. Ceramic workshops are also organised here and the pottery displayed in the restaurant is all for sale. Merlín Café’s originality does not stop at its decor, however; its rather unusual specialty is mushrooms.